Any time is the right time to have an intelligent voice raised in the community and in the Church. But now is a crucial time to hear Frank Brennan's discerning voice. When spin dominates political life and when we learn only today that legislation is about to be passed prohibiting medicos and teachers making any comment about our offshore Refugee-Asylum Seekers Centres (all the marks of a fascist state), issues must be raised and examined. We are just emerging from decades of a siege mentality in the Church when much of the spirit and vision of Vatican II was dismantled. 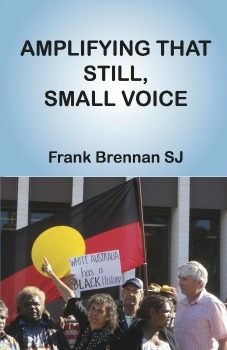 So Frank Brennan's book Amplifying That Still, Small Voice has arrived on time for many of us. One of the opening articles in the book 'Scrutinizing a Non-Transparent Hierarchy' is a timely reminder how Bishop Bill Morris of Toowoomba was hung out to dry by a gaggle of frightened and maybe some ambitious Bishops. Frank Brennan's clear and highly perceptive understanding of the study of legal matters is superb. No Church official would dare dabble in the 'Ellis defence' after Fr Brennan has examined it so well. As Chair of the National Human Rights Consultation, Frank Brennan listened to thousands of Australians voice their dreams and concerns. That time of enquiry and scrutiny will be a vital step in the ultimate process of our nation treasuring a future Human Rights Act. Decision making authorities — be it in Parliament, the Judiciary or the Church — all feel the need to protect their established positions. The move to review, refer and implement new measures is never easy. Yet the place of that still small voice is where Fr Brennan hits his straps. The Institutional Church has so often taken smug refuge in pushing the need for an informed conscience. However this does not certainly mean personal freedom must bow to the stand of the establishment. The rights of partners to be honest in their own sexual matters is given due place in this new book. He had to step back and let the first people of this country run with their ball. He was worried that, like white men and women, the black people could tear themselves apart. Yet it was time to let go, to trust, to hope and to pray. Throughout this book, Frank's love, care and professional expertise is gently offered to Aboriginal elders and people. He does this with gracious ease, not patronising authority. What a true man, priest and scholar. May this collection of papers, homilies and explorations be recognised and received by people who still wish to hear that still, small voice. This text is from Fr Michael Elligate's launch of Fr Frank Brennan SJ's book Amplifying That Still, Small Voice at Newman College, Melbourne, 5 June 2015.